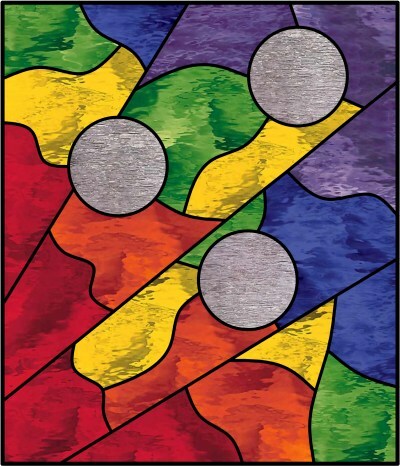 This panel was created as a donation for a community fundraiser in Berkeley Springs, West Virginia where I have my glass workshop. The concept grew out of a few things: a recent tour of the Spectrum factory, a day with the owner of the Not Afraid of Color studio in North Carolina, and a penchant for geometric design. I love bright, rainbow colors, especially the waterglass colors from Spectrum. By creating the design in Glass Eye 2000, I was able to change the score lines and the colors, then resize the panel to the size I wanted. The biggest challenge was knowing when the design was "done," as I have a tendency to continue refining without end. The panel was built using the copper foil technique, Spectrum waterglass, and Spectrum clear cord glass. Originally, the circles were to be rondels, but they simply didn't look right once the rest of the glass was in place. The finished piece is 12" x 14" and is framed in zinc came. The construction is a little tricky because of the two lines that create potential hinges. I had to be very careful turning the panel to solder the back. Since the piece is small, it was actually very stable once the zinc was installed. If I were to make it again, I would probably move the circles around to break up the two lines that run border to border. My husband initially bought me Glass Eye 2000 Standard Edition, which I later upgraded to the Professional Plus Edition. I never took drawing classes and still am not comfortable using pencil or pen and paper to draw my patterns. My professional career was spent in the software industry, so Glass Eye 2000 is the perfect tool for me. 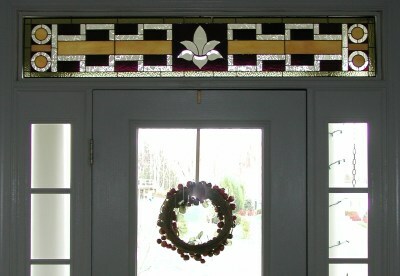 I used it to design a 60.5" x 10.5" transom, which is loosely based on a window I saw on an episode of Law and Order. We paused the program and took a picture. The picture wasn't so great, but it gave me enough to pick out the elements of the design that I liked. Glass Eye 2000 allowed me to work through many design changes before I settled on the one that I used to make the piece. I went through so many iterations that had I tried drawing it out by hand I would have gone crazy or given up. The software was also essential to helping me find the right glass for the project. This was my first large piece (large for me, anyway) and was the transom for the house we lived in at that time. We sold that house and the panel is now installed in a frame on top of a divider wall between our kitchen and living room in our West Virginia home. I have used Glass Eye 2000 to create several other designs. One piece I donated this year is of an Alaskan landscape, including tundra, mountains, and a river. It's based on a photograph I took during a trip to the region. I imported the photo into Glass Eye 2000, then traced the lines for each element of the design. There were many lessons learned with that project, but I'll save that for another time! 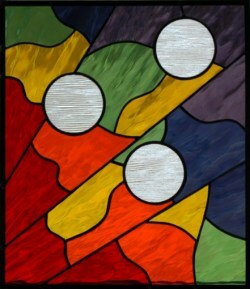 Linn's first exposure to stained glass came during a beginner's class in 2003, and more classes soon followed. In October 2008, Linn was accepted as an apprentice at Vetrate Artistiche Toscane, a stained glass studio in Siena, Italy. During her month there, she learned about restoration and increased her skills working with lead came. She also learned traditional methods for cementing. Linn now has a large, well-equipped workshop. Her newest interests are Prairie style windows, layering/plating, and incorporating fused glass into her stained glass projects. She has a website and can be reached by email.